Dubai woke up Sunday morning to a horror story. In what seemed to me to be a throw-back to the movie the Towering Inferno a fire broke out on the roof/top floor of a 34-storey tower in the city’s Jumeirah Lakes Towers development at around 2am. Incredibly, no one was killed or seriously injured and the tower’s 600 residents were evacuated from the building. The fire, which you can see a clip of below, took several hours to be brought under control. However, for the families who lived in the property which is owned by the Islamic mortgage company Tamweel, their ordeal has only just begun. According to news releases and press statements Tamweel has been supporting those made homeless by providing them with hotel accommodation. At Tamweel, our very highest priority is the safety and well-being of the owners and residents,” said Varun Sood, Acting Chief Executive Officer, Tamweel. “Our staff are on site and have provided transportation and hotel accommodation, in coordination with DMCC, to any resident who requires such assistance. We will continue to work with the Building’s Owners Association to assist all residents and we remain fully committed to ensuring their well-being. It’s no exaggeration to say that many families lost everything in the fire. Radio interviews with Tamweel Tower residents spoke of people running out wearing only their underwear and having to borrow clothing from others after they’d assembled at the emergency evacuation points outside the building. A wonderful piece was written in the Khaleej Times, a piece that conveyed the feeling of loss and confusion. If you’re hoping to gain a sense of how much some people were going through on the morning of the fire then do click through and read. The tragedy has been covered extensively in both traditional media and on Twitter, Facebook and Youtube. Residents were tweeting from the site pictures and uploading videos before the first stories had been published online (I read one Twitterer write in the early hours of the 18th that traditional media were yet to publish anything on the fire – if I can find his tweet I’ll publish here). The morning of the tragedy companies and individuals started to reach out via community forums and other online media to offer their services and support as well as provide details for those who want to volunteer and donate. 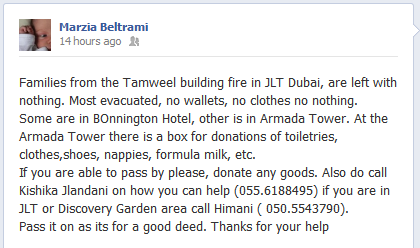 Head to the #ArmadaTower #JLT if you would like to donate any goods to the victims of the #TamweelTower fire! These community charity efforts are ongoing, as is the support given by Tamweel, and will be some consolation for residents who have lost all of their belongings in the fire. The speed with which social media has allowed people to express their support and rally others in the community to help the victims of the Tamweel Fire has been remarkable. How long would businesses or government bodies take to do the same? What is interesting to note is that Dubai Police also use Twitter to put out news alerts. For me, what’s also been striking is that the owner of the building Tamweel doesn’t have a social media presence. I’m sure, after what has happened, that will change in a very short space of time. This entry was posted in Social Media, United Arab Emirates and tagged Dubai, facebook, Tamweel, Tamweel fire, Tamweel Tower, twitter, youtube by alexofarabia. Bookmark the permalink.